In the Library on Wednesday the 3rd of April, Emily Frazer conducted a Carmelite Conversation on ‘The Martyrs of Compiègne and their Victory of Love’. The Martyrs were sixteen Carmelite nuns, executed during the Reign of Terror in Paris in 1794. In her preparation, Emily translated poems by Saint Elizabeth of the Trinity (1880-1906) that were inspired by the Martyrs of Compiègne. Emily apologises for her school French, saying “there are a few mistakes, but we can get a general idea.” Emily Frazer and Philip Harvey, whose French is likewise imperfect, worked on revisions of the three poems, with results below. 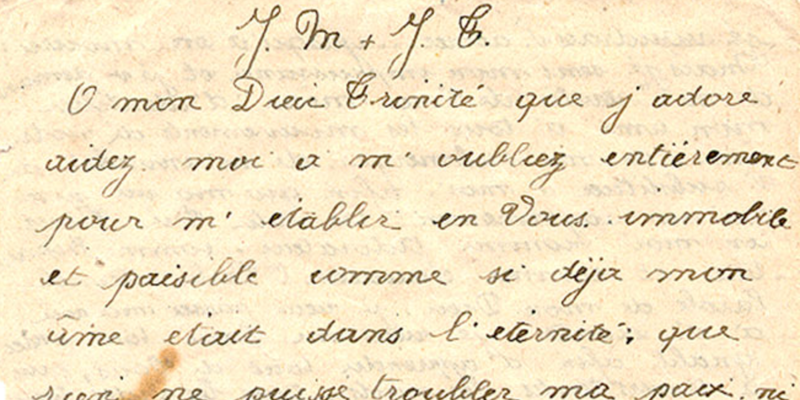 Saint Elizabeth of the Trinity, of the Dijon Carmel, is known to have written 123 poems, all of which appear in ‘J’ai trouvé Dieu. Oeuvres Complètes, Tome II, Journal et notes intimes, Lettres de Jeunesse, Poésies’ Paris, Les Editions du Cerf, 1979. The three translations are of P123 (pages 411-412), P85 (pages 358-360), and P94 (pages 374-377). The editorial notes to the poems have been included in English. So that He will consume you and the night and day. That He leads you to Carmel, that He makes you prisoner? Who asks of you,(3) o my Sister, great fidelity. It’s leading your life(4) into the Spirit of martyrdom. Immerse yourself in our God, Light and Charity. (P123) 1. Draft, in pencil. On the back, we read sixteen lines of the hand of Mother Germaine, belonging to the report she made for the SRD (21, 1906, pp.690-693) on the Triduum au Carmel of October 13-15, 1906. Mother Germaine has no doubt passed her text to the patient. The “beautiful day” that Elisabeth is talking about is October 22, the habit of “Sister” Marie-Josephe (cf. L327, n.5). The hymn of love that is sung above? And may our hearts salute this day, so beautiful! The Trinity who looks into us? That has revealed to us his clarity? By imprinting the purity of God. The soul in his soul and the eyes in his eyes. To give them the ineffable kiss. Wrapping his own in his clarity! Let us love, Sister, and everything disappears. The loving soul identifies with God. To contemplate like the blessed! And as in Heaven, we already adore! His divine name will shine on our forehead! When will come the end of the waiting? When will we finally be able to sacrifice ourselves? Because our Lamb wishes to purify us. To give back to Christ a little of his love? Because she too wanted to escape one day(8). Divine torment whose love is the sword! Flaming arrow, pierce us too(10)! (P85) 1. The authenticity of this poem is attested by Sister Agnes (cf. our Note on autographs of Elizabeth of doubtful attribution, supra, p.270). 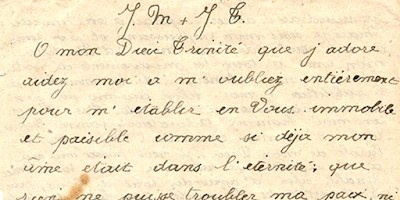 Two autographs are kept with the DCO’s and in addition the photocopy of a third one on which one reads: “These couplets were composed and written by the Servant of God Sister Elisabeth of the Trinity in 1902 [as the graphic confirms]; they were addresses to me, Sr. Agnes de Jesus- Maria, to encourage us reciprocally by going to martyrdom. I certify the authenticity. Sr. Agnes de Jesus- Maria.” Except for one word (see No.5), the three texts are identical, but the punctuation differs slightly. We chose the green paper autograph, where Elisabeth made some underlining. 2. Cf. Jn 15, 13. Elisabeth directed the citation to Christ. Same thing in P94. 3. See Mt 17, 5. 6. See He 1, 3. 7. See Ap, 14, 1. Where I met the Lord. Felt the melting of the heart. We offered a divine meal. She reaches the Sovereign King. It wishes to give always more and more. Of this divine Crucified One. His palace and his sanctuary. Sacrifice ourselves with a happy heart. And be consumed in his fires. To Jesus, his mystic Bridegroom. At the feet of this divine Saviour. Oh, everything in her was silent. Who gave it to us in turn. The home (8) of divine Love. As they were enflaming souls! By radiating his bright flames. Sang her song to the Lord. May your soul magnify him. To better affirm our faith. To make Him love for love. In their zeal and fervor. And our King will be victorious. For this plan to be realized. A foretaste of the divine abode. (P94) 1. Elizabeth indicates at the top of the poem: “St. Martha 1905” S345 does not indicate air. 2. Sister Agnes and Elisabeth, who are cooking this day, are busy working as if they were Martha and Mary welcoming Jesus to Bethany (cf. Lk 10, 38-42). See the testimony of Sister Agnes in L205, n.2. 4. This verse comes literally from poetry My peace and joy of Therese (“The Angel”) of Lisieux: HA, p.368 (My Joy, PN45). 6. See Lk 10, 39. 7. The prophet Elijah. From him Carmel received “the heritage” of “zeal the honor of the living God” as Elisabeth expresses it, joining 1Kings 19, 10 and 17, 1. 8. See footnote 3 of L190. 9. See Lk 1, 46. 10. Cf. 2Co 12, 9. 12. See Jn 15, 13. As in the epistle of P85, Elizabeth returns the Word of Jesus to Him. 13. See 1Cor 15, 31. 15. The expression generally indicated the first Carmelites of France. The Carmel of Dijon was founded by the Venerable Anne de Jesus, very related to Therese d’Avila and came to France as founder. Dijon was the third French Carmel.